The Atlanta residential real estate market continues to remain hot as fire; with those in the market to sell their home reaping the reward. 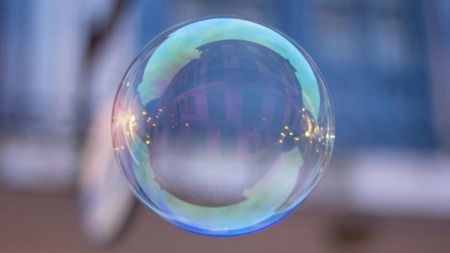 We saw a flurry of activity in March, with substantial jumps in the number of closed sales, selling prices and list prices. Despite a year over year increase in new listings hitting the market, the lack of available inventory of homes for sale continues to play a significant role in pushing home prices upward. Interest rates have actually gone down in the past month or so, bucking the expectations of many in the mortgage industry. This, combined with an unemployment rate that continues to fall, seems to be motivating more and more buyers to enter the market. The influx of home buyers flocking to the market has created a demand for homes that seems to outweigh the supply. It's only April, and it appears the frenzy will continue for at least a couple more months. The market data and housing statistics contained in this report come from FMLS and CoreLogic. Unless otherwise specified, the market trends in this report are based off of single family attached & detached properties listed on FMLS. 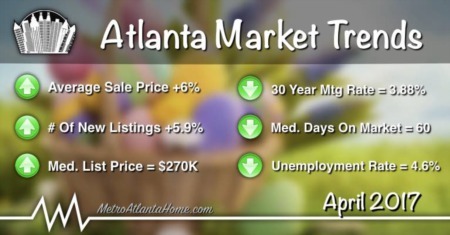 MetroAtlantaHome.com has taken all reasonable steps to ensure the information in this report is current and accurate, it cannot however guarantee the accuracy of information or that it is current. After two months of stagnant price increases to start the year, we saw a massive jump in the average sale price during the month of March. Since sale prices in March are primarily a reflection of the contracts that went into effect in January and early February, these increases are due to contracts initiated after the new year. From what I’ve seen, most of the hot new listings start hitting the market after the holidays are over. This, combined with a renewed interest from home buyers, results in massive sale price increases. No matter how you look at it, it’s apparent that buyers have come out of the gate strong thus far in 2017. This year’s spike in prices is one of the largest month over month increases we’ve seen in the past five years. At $278,859, Metro Atlanta’s average sale price in March was the second highest we’ve seen in nearly a decade. As you’ll notice in the chart above, the average price last month was about 7.4% higher than it was in February. In addition, annual price appreciation has continued with nearly a six percent increase over last year’s figures. After a relatively slow month in February, home sales absolutely took off in March. Last month there were 7,912 closed transactions in Metro Atlanta, representing a 10.9% increase from the same period last year. As you can see in the chart below, the number of closed transactions last month was higher than it's been in years. Just three years ago (March 2014), there were only 5,128 properties sold in Metro Atlanta. Therefore, in only a few years, the number of monthly sales has increased more than 54%… despite less homes being available for sale. We’re used to seeing more homes selling starting in March, but the increase in closed transactions was even more pronounced this year than it’s been in the past. By comparison, in 2014, the number of sales increased 23.9% from February to March. In 2015, the increase was 37.8%, and in 2016 it was 37.9%. However, this year’s 52.7% jump in transactions shows the spring real estate market is hotter than it’s been in a long time. It looks like we could be in for a record setting year of home sales. Want to know what the number one driving factor in Atlanta’s residential real estate market is? I’ll give you a hint… it has to do with supply and demand. The answer is: the availability of homes for sale. More importantly, the lack of them! 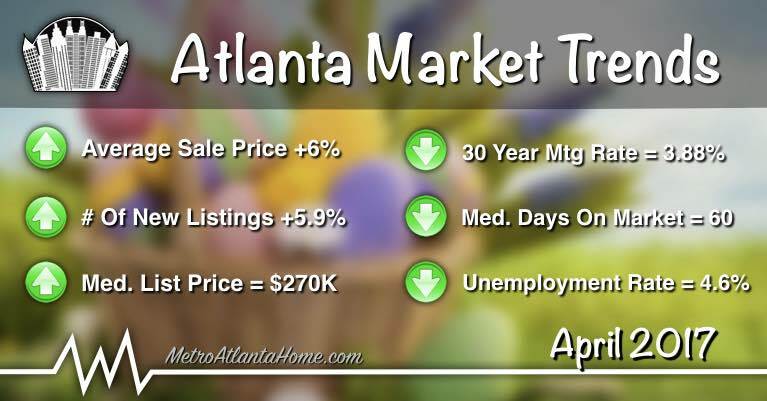 As you can see in the chart below, the number of active listings in Metro Atlanta has continued to drop. As I’ve mentioned before, this downward roller coaster ride started back in 2011, and it has continued to drive prices upward. Outside of some slight increases in 2014, the active inventory has steadily worked its way down. In March, there were only 20,812 active listings for sale. This was an increase of 4.4% from a month earlier, but a 7.4% decline from the same period last year. Without a turnaround in this recent trend, the market will continue to favor sellers, and home prices will continue to increase. The average list price in Metro Atlanta has increased again, this time, surpassing the 10 year high mark that was set a month earlier. However, the increase isn’t as large as the one we saw last year at this time. With most homes selling rather quickly, often with multiple offers, you'd expect to see that demand reflected in current asking prices. As you can see in the chart above, the average list price in March was $367,204. Increasing more than $17,000, the average list price jumped nearly 5% from where it was at the same time last year. These higher asking prices have translated into higher selling prices, as I mentioned earlier. The early year price hikes are a sign of things to come, and I anticipate this upward trend to continue for at least another month. It might not seem like much of a drop, but the number of days from when homes were first listed to when they sold, dropped by seven. Considering the fact that this number was only 67 a year ago, I’d say it’s a pretty significant drop in the number of days on market. Caused by both a decline in both the median days to contract (-4) and the median days from contract to settle (-3), the overall time in which it’s taking homes to sell is at a record low. As I mentioned earlier in this article, the lack of homes for sale has created all sorts of market pressures. In addition to pushing prices higher, the shortage of homes for sale has also impacted how quickly properties are going under contract. Having quickly explored all their options, many buyers simply wait for the next “good one” to hit the market, then they pounce on it quickly. Outside of the overpriced listings and downright ugly homes, everything else seems to be selling in no time flat! As I mentioned earlier, the average list price is up, but I think the average list price per square foot paints a better picture of what’s going on. In March, the average list price per sq/ft topped out at $145… $24 more than the five-year average. This is a 14.2% increase from March of 2016 and more than a 30.6% increase from where it was just three years ago. These numbers show the true premium sellers are placing on their homes so far this year. The average sale price per square foot also experienced solid gains last month, posting a 9% increase from the year prior. This was $17 higher than the five year average, and $7 higher than it was just one month earlier in February 2017. The median sale price per sq/ft also trended higher, finishing up the month at $105, a 8.3% year over year increase. These numbers tell me that actual home values are still on the rise. It looks like Atlanta’s residential real estate market will continue to experience price appreciation this year, and the rise in home values could be even more than what we saw last year. Current estimates show Atlanta home values in the month of February are up approximately 7.1% in the past year. If you’ve been thinking about selling, now is the time to take advantage of this seller’s market. Need to know what your home is currently worth? Check out our home value estimator tool for a detailed analysis. Despite what many in the mortgage industry thought would happen, mortgage rates actually dropped after the Federal Reserve’s benchmark rate announcement last month. However, interest rate increases had already been priced into the market, so rates didn’t jump up the way people were afraid they would. Immediately following the March 15th announcement, mortgage rates started to decline across the board, and they’ve been on a downward trend ever since. According to a recent Builder Application Survey conducted by the Mortgage Bankers Association, mortgage applications for new homes accelerated in March, increasing 6.7% year over year. The survey also showed that almost two thirds of the homes being purchased had loans ranging from $200K-$400K. Overall loan activity, including mortgage refinances, has also trended higher lately, thanks to the decline in interest rates. Note: The interest rate estimates featured in the chart above were obtained from Bankrate.com. The mortgage rates listed are general estimates for the state of Georgia during the given time periods. Mortgage rates may vary by location, loan type and the amount financed. Specific rates depend on an individual borrower’s credit history, income and assets. This does not constitute an offer to lend or the guarantee of an interest rate. As you can see in the chart below, Metro Atlanta’s non-seasonally adjusted unemployment rate has bounced around a bit in the past couple months, ranging from 4.6% to 5.4%. Fortunately, the low end of the spectrum occurred last month when the unemployment rate reached its lowest point in several years. Compared to last March, the metro area’s unemployment rate was down a half percent… quite a big move in only a year’s time. As can be expected, the number of unemployment insurance claims also dropped over the past 12 months, down 7.6%. At just over 12,000 insurance claims, March’s figures were also down about 1.1% from a month earlier. This is great news for the local economy in general, and likely another driving force in the demand for housing. Note: The Atlanta Metropolitan Statistical Area (MSA) unemployment rate and number of unemployment insurance claims were obtained from the Georgia Department of Labor. The Atlanta MSA is comprised of the following counties: Barrow, Bartow, Butts, Carroll, Cherokee, Clayton, Cobb, Coweta, Dawson, DeKalb, Douglas, Fayette, Forsyth, Fulton, Gwinnett, Haralson, Heard, Henry, Jasper, Lamar, Meriwether, Morgan, Newton, Paulding, Pickens, Pike, Rockdale, Spalding, and Walton. Note: The following community market trends include data from active/sold residential properties (attached & detached) listed on FMLS. The percentage increase/decrease shown reflects the year over year change. 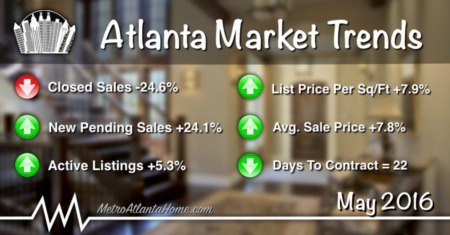 Alpharetta: Last month there were 217 (+8%) homes sold in Alpharetta at an average sale price of $410,186 (+7.6%). The average days on market was 80, up from 59 a year ago. The number of new listings increased 14.8% to 434, putting the number of total active listings in Alpharetta at 601 (+11.9%). Currently, the average list price in this area is $543,120 (+6.9%), at a price per sq/ft of $157 (+10.6%). Avondale Estates: Last month there were 12 (+9.1%) homes sold in Avondale Estates at an average sale price of $303,775 (+3.6%). The average days on market was 36, down from 78 a year ago. The number of new listings increased 11.1% to 20, putting the number of total active listings in Avondale Estates at 19 (-34.5%). Currently, the average list price in this area is $428,425 (+29.2%), at a price per sq/ft of $207 (+55.6%). Brookhaven: Last month there were 93 (+6.9%) homes sold in Brookhaven at an average sale price of $497,120 (+7.8%). The average days on market was 51, down from 63 a year ago. The number of new listings decreased 2.8% to 173, putting the number of total active listings in Brookhaven at 252 (+1.6%). Currently, the average list price in this area is $586,909 (+2.4%), at a price per sq/ft of $218 (+5.3%). 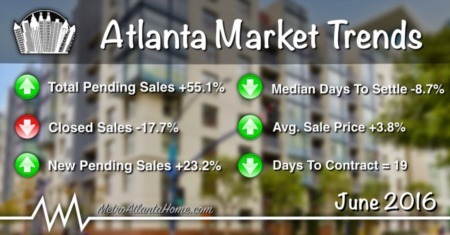 Buckhead: Last month there were 202 (+12.2%) homes sold in Buckhead at an average sale price of $542,093 (-15.8%). The average days on market was 78, down from 90 a year ago. The number of new listings increased 12.7% to 398, putting the number of total active listings in Buckhead at 869 (+12.6%). Currently, the average list price in this area is $939,279 (+12.4%), at a price per sq/ft of $292 (+11%). Chamblee: Last month there were 34 (+17.2%) homes sold in Chamblee at an average sale price of $304,818 (+9%). The average days on market was 32, down from 36 a year ago. The number of new listings decreased 2.2% to 45, putting the number of total active listings in Chamblee at 48 (-5.9%). Currently, the average list price in this area is $327,958 (-3.5%), at a price per sq/ft of $204 (+11.5%). Decatur: Last month there were 43 (-18.9%) homes sold in Decatur at an average sale price of $494,841 (+9.7%). The average days on market was 56, down from 76 a year ago. The number of new listings decreased 12.1% to 87, putting the number of total active listings in Decatur at 87 (-12.1%). Currently, the average list price in this area is $545,459 (+3.5%), at a price per sq/ft of $252 (+4.1%). Doraville: Last month there were 9 (-10%) homes sold in Doraville at an average sale price of $242,711 (+54.3%). The average days on market was 35, up from 22 a year ago. The number of new listings decreased to 9, putting the number of total active listings in Doraville at 21 (+40%). Currently, the average list price in this area is $193,767 (+13.2%), at a price per sq/ft of $126 (+8.6%). Duluth: Last month there were 93 (-11.4%) homes sold in Duluth at an average sale price of $262,974 (+6.1%). The average days on market was 61, down from 71 a year ago. The number of new listings increased 4.5% to 187, putting the number of total active listings in Duluth at 230 (-19%). Currently, the average list price in this area is $419,830 (+11.4%), at a price per sq/ft of $125 (+8.7%). Dunwoody: Last month there were 75 (+33.9%) homes sold in Dunwoody at an average sale price of $396,140 (+1%). The average days on market was 43, down from 73 a year ago. The number of new listings increased 12.2% to 110, putting the number of total active listings in Dunwoody at 120 (-6.3%). Currently, the average list price in this area is $465,922 (+15.8%), at a price per sq/ft of $179 (+11.9%). Johns Creek: Last month there were 129 (+11.2%) homes sold in Johns Creek at an average sale price of $404,995 (-4.1%). The average days on market was 78, down from 100 a year ago. The number of new listings increased 21.5% to 271, putting the number of total active listings in Johns Creek at 397 (+16.1%). Currently, the average list price in this area is $583,268 (+14%), at a price per sq/ft of $149 (+8%). Lilburn: Last month there were 75 (+8.7%) homes sold in Lilburn at an average sale price of $252,314 (+26.9%). The average days on market was 78, up from 77 a year ago. The number of new listings decreased 20.2% to 87, putting the number of total active listings in Lilburn at 122 (-34.8%). Currently, the average list price in this area is $241,658 (+10.8%), at a price per sq/ft of $94 (+4.4%). Norcross: Last month there were 56 (-29.1%) homes sold in Norcross at an average sale price of $217,153 (+15.7%). The average days on market was 52, down from 75 a year ago. The number of new listings decreased 6.5% to 86, putting the number of total active listings in Norcross at 114 (-14.9%). Currently, the average list price in this area is $226,286 (+0.6%), at a price per sq/ft of $103 (+1%). Roswell: Last month there were 174 (+11.5%) homes sold in Roswell at an average sale price of $402,141 (+1.5%). The average days on market was 67, down from 76 a year ago. The number of new listings increased 30.5% to 321, putting the number of total active listings in Roswell at 404 (+17.8%). Currently, the average list price in this area is $511,083 (+6.7%), at a price per sq/ft of $156 (+9.1%). Sandy Springs: Last month there were 153 (-3.8%) homes sold in Sandy Springs at an average sale price of $507,642 (+22.4%). The average days on market was 82, up from 77 a year ago. The number of new listings increased 13% to 313, putting the number of total active listings in Sandy Springs at 563 (+0.5%). Currently, the average list price in this area is $723,434 (+3.1%), at a price per sq/ft of $188 (+4.4%). Tucker: Last month there were 59 (+18%) homes sold in Tucker at an average sale price of $234,644 (-0.5%). The average days on market was 58, down from 70 a year ago. The number of new listings increased 4.7% to 67, putting the number of total active listings in Tucker at 79 (-27.5%). Currently, the average list price in this area is $251,079 (+10.2%), at a price per sq/ft of $112 (+14.3%).